Last Tuesday, instead of my usual routine ...work,work work!! I gave myself a day off from Chittypulga and joined my big daughter on a field trip to The Bronx Zoo... It was one of those glorious days in New York City, perfect weather, sunny, no humidity, no traffic... What else could we ask for? I took my little daughter too and stroller in hand, followed a crowd of loud first graders, gossipy moms and vigilant teachers on our zoo-venture. Whether you live in NYC or are coming over for a visit, The Bronx Zoo is an obligatory stop. While impossible to walk the whole park in one day with so many kids and stops, it was just fantastic to spend quality time in selected areas. Our favorite ones, Madagascar and the Butterfly Garden. Both of my daughters were fascinated recognizing some of the movie characters on real animals at the Madagascar area. It is amazing how this parade of exotic lemurs, fossas, crocodiles and geckos live in a zoo, but a perfect replica of their natural environment. 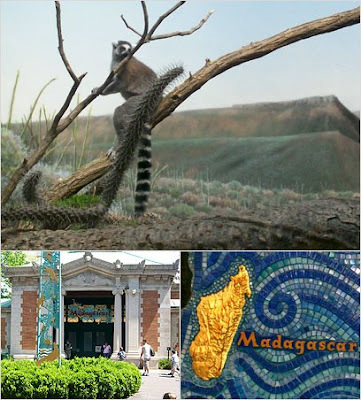 Madagascar is the fourth largest island in the world and it is also home to rare and endangered animals found nowhere else on Earth.... Particularly, I had never seen most of them!! Walking among screaming kids, trying unsuccessfully to keep a conversation going, we stumbled upon the Congo Gorilla Forest and... wow!! Didn't those monkeys look like us? We spent a long time hypnotized by the family-bound gorillas and their lifestyle... Mothers feeding their babies, daddies taking a nap, groups just chilling in the middle of their artificial forest while chewing some celery... Ahhhh!! The peaceful life!! 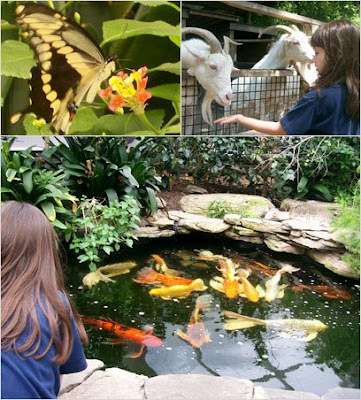 Perfect for a Zoo-venture ending, "The Butterfly Garden". A huge green-house with a Feng-Shui touch (I wish I had one like that in my backyard). All of a sudden, we were surrounded by monarch butterflies and colorful flowers, sprayed by refreshing mists of water and just to soothe my soul, a gorgeous pond with koi fish dancing in the water... Hmmm! For a moment I forgot this one was my daughter's school trip and let my mind fly to paradise... Nice!! ... Of course, my daughters could not leave without pulling my arms and pushing my bottom into the Zoo shop, even for just three minutes... However, I must admit the Bronx Zoo Shop could have kept me in for a lot longer than a few minutes... The store is filled with stuffed characters based on the real animals living at the Zoo. Cute baby gorillas and bears with their little cards attached and a short bio of themselves.. Smart, graceful, educational and reasonably priced. It was really awesome to take a day off in the middle of the week and enjoy life, kids, friends, nature... Whether you work for somebody or just for yourself, take a day off for no other reason than wanting to have fun... It feels sooooo good! !